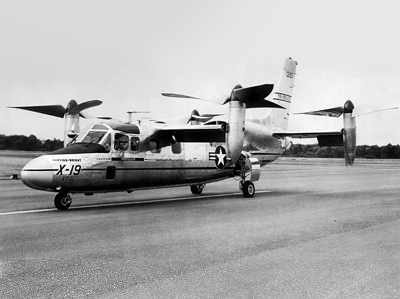 The Curtiss-Wright X-19 was an ambitious design for a vertical-take off and landing (VTOL) aircraft developed in the 1960's from the Curtiss-Wright X-100, a smaller twin-rotor design with similar tilt-rotor propellors. The X-19 consisted of a conventional aircraft fuselage coupled with a pair of similar sized wings positioned at either end of the body. Attached to the end of each wing was a 4 metre (13 foot) three bladed propellor mounted on a swiveling pod which could be rotated through 90 degrees to provide either upward lift or forward momentum for higher-speed travel. Sadly the flight record for the Curtiss-Wright X-19 was not outstanding. On its first flight the aircraft was damaged and spent several months undergoing repairs before resuming tethered flights in the summer of 1964. 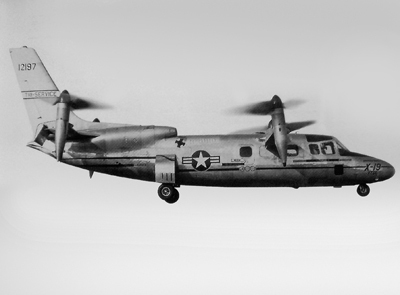 In 1965 on the first full test flight which was designed to demonstrate the transition between the two propellor positions the X-19 was destroyed. Miraculously both pilots survived thanks to the ejector seats which were fitted to the aircraft. After this crash the project was canceled. Only two prototypes of the Curtiss-Wright X-19 were produced. The surviving example is currently housed in the restoration facilities at the National Museum of the United States Air Force in Dayton, Ohio.